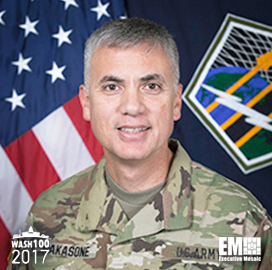 Executive Mosaic is honored to announce Lt. Gen. Paul Nakasone, commanding general of the U.S. Army Cyber Command, as an inductee into the 2017 edition of the Wash100 – Executive Mosaic’s annual selection of the most influential voices in the government contracting arena. Nakasone leads an organization that works to direct and conduct integrated electronic warfare, information and cyber operations authorized or directed to help reinforce action in the cyberspace and information environment. Under Nakasone’s leadership, the Army broke ground on a new facility at Fort Gordon in Georgia which will be established to combine the service branch’s cyber, education, training and capacity development operations. During his stint as Cyber Command chief, the Army has employed all of its 41 Cyber Mission Force teams to protect Defense Department networks and the service branch continues efforts to boost defenses. The service branch expects the CMF teams to be operational within the end of the year and an investment in the reserve component’s 21 cyber protection teams will look to bolster network defense capacities. Nakasone took over as head of Army Cyber Command and succeeded Lt. Gen. Edward Cardon, who transitioned to director of the Army’s Office of Business Transformation. Nakasone also serves as leader of Army Cybercom’s Joint Task Force – ARES, which offers cyberspace support to military efforts against the Islamic State militant organization in Syria and Iraq. His career includes leadership roles at Cyber National Mission Force, J2, International Security Assistance Force Joint Command. Executive Mosaic congratulates Paul Nakasone and the Army Cyber Command team for their selection to receive this award.